Whitney Vickers | Greene County News The candidate must be 18 years old, have a reliable vehicle, a valid driver’s license and proof of auto insurance. To apply, stop by our office 8 a.m. to 5 p.m. Monday through Friday at 1836 W. Park Square in Xenia. For more information, call 937-372-4444. 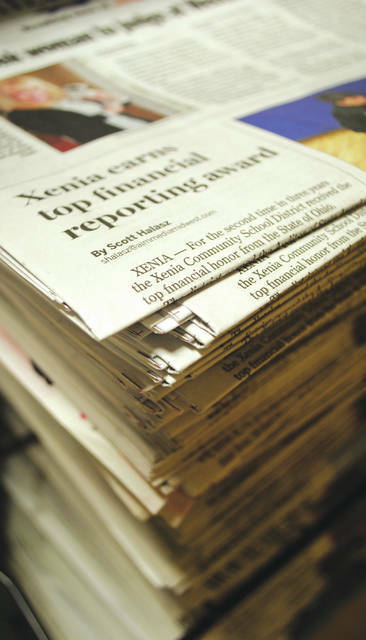 XENIA — The Xenia Daily Gazette and Fairborn Daily Herald are seeking a bulk newspaper carrier. The carrier would be responsible for delivering our publications to post offices in Bellbrook, Beavercreek, Fairborn and Enon. The individual would work in the early morning hours Tuesday through Saturday for approximately 10 hours per week. The candidate must be 18 years old, have a reliable vehicle, a valid driver’s license and proof of auto insurance. To apply, stop by our office 8 a.m. to 5 p.m. Monday through Friday at 1836 W. Park Square in Xenia. For more information, call 937-372-4444.
https://www.fairborndailyherald.com/wp-content/uploads/sites/50/2019/02/web1_carrier.jpgWhitney Vickers | Greene County News The candidate must be 18 years old, have a reliable vehicle, a valid driver’s license and proof of auto insurance. To apply, stop by our office 8 a.m. to 5 p.m. Monday through Friday at 1836 W. Park Square in Xenia. For more information, call 937-372-4444.